Steve Tingle, Director of Commissioning and Adults (front), with Sally McIvor, Executive Director of People, Councillor Mohammed Khan, Executive Member for Health and Adult Social Care and Councillor Arshid Mahmood, Executive Member for Housing, Neighbourhood and Customer Services at Moorgate Mill. The supported living scheme will see 20 new one bedroom apartments built at Moorgate Mill, Moorgate Street, Mill Hill, which will cater for people between the ages of 18 to 65 who have physical and learning disabilities and complex need. The development will have support workers on site and the flats will have in built assistive technology to further help those living there maintain their independence. People that could benefit from this type of scheme are being identified now with the first due to move in June. This is the first facility of its kind in the borough. 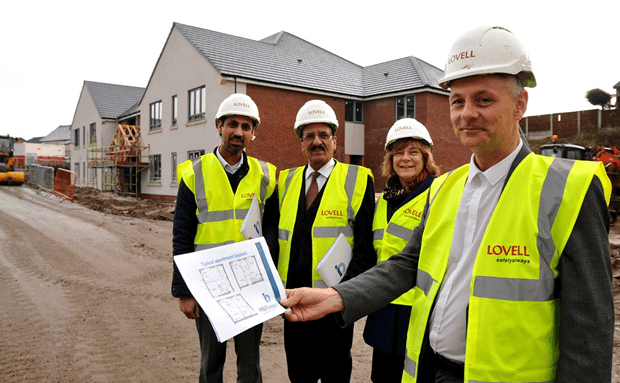 Councillor Mohammed Khan, Executive Member for Health and Adult Social Care, and his colleague Councillor Arshid Mahmood, Executive Member for Neighbourhood, Housing and Customer Services, visited the to inspect progress of the work. Councillor Khan said: “This development is great news for the borough. “We are committed to giving residents more choice and control over their care and support and we want to make sure good quality services are readily available whether they are provided by the Council, the voluntary sector or the private one. “This development fits in with this commitment. “We are also committed to developing and investing in services that offer early support and helps people live as they wish. This development will provide support that suits them. Councillor Mahmood said: “This will be a fantastic development and will provide top quality accommodation for some of the borough’s most vulnerable adults.